Bong Woo-Ri (Kim Sae-Ron/Hwang Jung-Eum) was a bright 9-year-old girl, but she didn't have a name or a father. Her mother was also deaf. Nevertheless, there were good people around her like Bong Young-Gyu (Jung Bo-Suk) - a man who loved her mother and was also mentally deficient. The Young-Gyu lived with his elderly mother and his son Bong Ma-Roo (later played by Nam Gung-Min). Bong Ma-Roo was an honor student who was insecure about his foul-mouthed grandmother and his mentally deficient father. To make matters worse, his father married a woman who was deaf. Meanwhile, 9-year-old Bong Woo-Ri was elated that she finally had a family and a name. Tragedy soon struck when a fire occurred in a factory where their deaf mother worked. Their mother died in the fire and their father was taken into police custody because of a frame-up . Ma-Roo left his sister and said he would come back. Now, Bong Woo-Ri, her grandmother and father awaited his return. Kim Jae-Won lost 5kg for his role as Cha Dong-Joo. 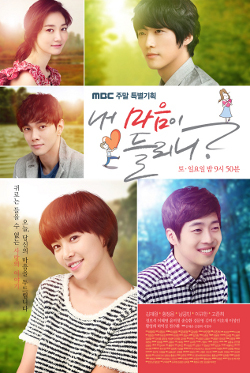 "Can You Hear My Heart" takes over the MBC Saturdays & Sundays 21:45 time slot previously occupied by "Flames of Desire" and followed by "Hooray for Love" on July 16. Filming for "Can You Hear My Heart" is expected to start in March, 2011. Shnt Jun 02 2018 6:34 pm Watch it when this drama aired in my country. Coming here to check how much rating it gets in hankuk, but why such a heartwarming drama like this not get good rating until the very final episode. This drama was sooooo heart warming, often tearingup because of the touching and lovable story about family. Their chemistry as co-actors. Love all of it. And and and all the OST!!! Ftrananta Oct 08 2017 8:15 am I watched it in 2012 and still rewatching several times when i miss this drama. Very hearwarming drama, all the cast was gave their best acting Whenever i watch this movie, very hard to hold my tears. Kim jae wan, Nam gung min are very excellent actor. Hwang juneg eum eonni also pretty good!! I hope Kim jaw wan will come back in screen soon. Please!! Nine May 06 2017 4:30 am Can't believe it had been 6 year since this drama, now the young cast all grown up, one is a kpop idol and the other is the lead actress of mirror of the witch, i feel so old even though they're one year younger than me ?? Angie Nov 30 2016 11:26 am most amazing kdrama . I watched that with all my soul pleasure . Best actors Kim Jae-Won,Hwang Jung-Eum ! Wish you all the best and I'll wait for your future kdramas. Asnnerd Aug 02 2016 10:34 am Still one of my favorite drama's. Amazing cast and story-line. Especially the child actors did a great job. This drama really shows the importance of having a family. That's why I love Kdrama's so much. Behind a little gesture, there is so much meaning. Those things you can see a lot of in this drama. It's a drama that can def. touch you in so many ways. Aj May 02 2015 5:47 pm It's okay, but predictable. Having seen so many KDramas and Korean films, I'm more demanding than this one rises to. Max P Jan 15 2015 8:17 pm A rather silly drama, a love drama turn into typical corporate family fight, a love is lost in the story. the love between dong and woo is lost as woo cannot stand by dong when joon is involved, hence dong fights the battle along. this is sad story, loss of trust and loss of stand by me. this contradict the drama, can you hear my heart not in sense of love, but yelling at woo can you not hear my heart crying for you, but you cannot hear you stupid woo haha woo is this drama is annoying, she is the one that makes joon worst, as a man has to fight for a love one. Joanna Nov 29 2014 11:24 pm Does anyone know which episode Bong Woo Ri burns her hand in? debi Mar 16 2014 11:43 am this drama so great ,really love it.but i think its a romance between dong joo and jun ha..really gay..but they hot..so i love it lol... But the drama really amazing and fascinating, I suggest everyone to see. Victoria R Gadiano Mar 11 2014 12:19 pm What is with Bong Uri and her backpack? Nina Feb 15 2014 1:03 pm I absolutely LOVED this drama. Amazing cast, and story line; I cried a couple times, just sooo good. Great job! Gyinaaa Dec 31 2013 6:19 am This drama touched my heart. I rl like this drama.ts my favorite it was so funny Woo ri 9years old with no name how she speak faster I like Cha doong joo the most. samieEXO Dec 27 2013 9:09 am don't listen to Kate, its a great drama i watched from episode 1 to 30 and i enjoyed every minute of it. sibae Oct 26 2013 7:10 am the main actors are very good and even the kids. just want special mention to jong bu sok who played dad of bong woo ri ssi. excellent acting. you deserve the award. Laura Dern Aug 16 2013 10:20 am Bong Jung Hyundai and his daughter make me tired when I watch them with all these shenanigans. They never quit moving. I don't think I could live with someone like that. They would age me in a minute. herbmom Aug 14 2013 2:04 pm I loved this drama. Just finished and wishing it went on a bit longer. Would love to see Woo-Ri and Dong-Joo as a couple more, and Joon-Ha find some happiness. Tender moments....grandma was great, young-gyu was amazing, loved the brother relationship. I cried more than once over 30 episodes. Good story, great acting, botanical garden beautiful. sporean May 15 2013 8:50 pm LOVED this show. LOVED Dongjoo and Woori. I'm a big believer in destiny - that Woori was destined to be with Dongjoo and had been "prepared" for her role as the companion of deaf Dongjoo since young by her deaf mother. They were just meant to be. The only reason I voted 98% out of 100% here was that I wanted even more Dongjoo-Woori scenes and MORE kissing and didn't get that!! Didn't anyone find Ma Roo/Jung Ha creepy in the way he looked at his sister Woori? I was SO worried he was going to force himself on her when he asked her to sleep over at his apartment. Seung Chul was spot-on in saying that Ma Roo/Jung Ha saw her as a woman and not a sister. So creepy! Jocylin 조술란 May 12 2013 4:03 pm As most people who know me would say, I'm not much of a crier. . But this drama took all my reserves away and had me bawling like a little girl by the 4th episode. No drama has touched my heart the way that this has. And upon finishing it yesterday I'm having extreme withdrawals and a strong urge to watch it all over again. I love the way cha dong joo's deafness was portrayed and although as an asl signer I knew his talking was too good the drama didn't lack because of it. I was so happy that i could learn some Korean sign language as well because online ksl resources are extremely limited. :) I highly recommend this drama because truly it moves you and it just made me feel so enlightened. . Plus it gave me a glimpse of how deafness is portrayed in Korea. I usually don't have a lot to say about a drama but I'm holding back as i could talk for like ever about this fantastic drama ... honestly though WATCH THIS DRAMA if you have not. Lastly (as I'm struggling to not write a novel here) 차동주 사랑해요! Wendilynn Apr 24 2013 11:09 am I started watching this drama for the love story because it sounded intriguing. Ended up watching it for Jang Joon-Ha character who is the glue that keeps this drama in check. His story steals every scene and is amazing. Min Namgung gave a very powerful performance. The love story ended up not moving me much, which surprised me because I love the two lead actors, but I don't think the writers were as brave as they could have been with the challenges these characters could have had. MNG is the true lead in this story. Patricia Apr 09 2013 3:47 pm What is the song that Bong Young-Gyu sing for his mother? Anyone knows the name of it? jaglaine Nov 09 2012 12:08 am This is a really good drama. A bit longish, considering that it's 30 episodes. But if you gear yourself up to the fact that it is 30 episodes, hence, some scenes will be extended (as expected), you'll be okay. It has a good, solid storyline. Each episode building up to a satisfying ending. The family dynamics are quite interesting. It had well-defined characters. The characters, the changes that some of them have undergone, drew me in and got me hooked. I loved the brotherhood between Cha Dong Joo and Jang Joon Ha, they were such a joy to watch. Min Soo summed up their relationship very well! LOL! Dong Joo, born wealthy but, nonetheless, very unasssuming both as a child and as a man. I loved this character! The love between Dong Joo and Woo Ri will satisfy those who are suckers for romance. And Kim Jae Won played him to a tee! Nam Gung Min was also perfect as Joon Ha. Lee Hye-Young, beautiful, great actor. Jeong Bo Seok made Bong Young Gyu as real as can be. Overall, great story, great acting. I fully recommend this as a must-watch drama. Yohanna Veshanya Oct 08 2012 6:16 am I love this drama! This drama really touched my heart. Thank you, producer, writer and director of this drama. Neiba Jung Aug 06 2012 4:17 am I've never seen such type beautiful drama. "Kim Sae Ron, this drama attracts me because of you." I really appreciate by her action. Gasenadi Aug 01 2012 8:18 am Jang Joon Ha's character was the reason I stayed with this drama. He was brilliantly portrayed by young Seo Young-Joo and adult Nam Goong Min, who I've never seen before but will search for starting NOW. Compelling series depicting family and what it REALLY means. No one does abandonment/betrayal like kdrama. Forgiveness, here, is not cheap, either. YAY! I started watching for Mr. Lee (Lee Seong-Min) and Woo-Ri (Hwang Jung-Eun) while their latest drama, "Golden Time", is complete. Agree with other reviewers that Grandma, Young-Gyu and Dong Joo were awesome. The MUSIC is almost operatic; everytime those violins started, I cried. Ary Jun 25 2012 10:33 am i love this drama, & of course the lead actor Kim Jae-Won and also Nam Gung-Min . they r the best. nice story line, perfect acting, its really worth watching, its highly recommended! NewKDramaAddict Dec 20 2011 8:11 am This was a wonderful drama; did not care the ending as much but overall, it flowed and had a story to tell. There were no love triangles, per se, which I hate. Even though Dong-Joo's mother had an ulterior motive for taking Ma-ru; she never mistreated him. Not saying what she did was right/wrong but it was understandable! The acting by all was phenomenal! boo Nov 29 2011 8:53 pm One of the best and heartwarming Korean drama series I have ever seen. It truly touches human hearts as well as difficulties and struggles in life that Love cannot surpass... in any relationship. I congratulate all that is behind this drama... a must see of families because it gives us a picture of the real meaning of family.. that it is not confined in blood relations but on how one accepts the other and opens himself/herself up to that person to be part of his/her life. Forgiveness, unconditional love, acceptance, and what is more touching is the drama's perception and sensitivity to people who are physically challenged. I love the treatment and process of acceptance of someone who is shut off from sounds and voices for all his life and someone who is branded as "foolish" but, these two people represents in their character portrayal that what seemed to be lacking in them are not "lacking" at all because they are so capable of what it takes to be truly human, that is, someone who can love and forgive... unconditionally... God bless... i hope that more dramas like these will be produced. me Sep 03 2011 9:00 am Cha dong joo looks very young.im surprised when i saw his old. Jang Joon Ha! once again im falling in love with the bad ones lol. MonikaB Aug 07 2011 8:10 am Excellent drama! The well written script held my attention for the 30 episodes. The actors all did a very good job. Kudos to all three of the young actors (Kang Chan-Hee, Kim Sae-Ron, & Seo Young-Joo) for their strong performances. vca4109 Jul 14 2011 10:09 am a veryvery very nice drama, i cried a lot! ....really good actors and actresses... excellent directors' and writers'....a must watch!!! .... love them all!!!! KJW forever May 13 2011 12:18 pm It's a must to watch it... sadness,happiness,family..everything is mixed very well you'll cry,you'll laugh.. as far as the episode goes,it has been a heart-touching series. Hopefully it won't be a too long series to watch as people will get bored. star Mar 11 2011 2:44 pm omgg. can't wait to see this (: hwang jung eum & kim jae won makes a good couple.